Hair loss can be caused by a number of factors, including hereditary thinning, medical conditions, prescription drugs, psychiatric disorders and over-processing of the hair. Some of the medical conditions that lead to hair loss directly affect the skin of the scalp. These conditions cause inflammation of the hair follicles, which causes hair to fall out. While this hair loss is usually temporary, some severe forms of these conditions can cause permanent hair loss. Infection of the hair follicles is known as folliculitis. This condition develops when the hair follicles are invaded by bacteria, fungi or viruses. Folliculitis may cause clusters of red bumps, itchiness, skin tenderness and blisters filled with pus that break open and crust over. If the folliculitis is deep, it can cause a swollen mass, pain and scarring once the infection has been treated. Hair loss may occur as a side effect of the inflammation in the hair follicles. This hair loss is usually temporary, but severe cases of folliculitis cause so much inflammation that the hair may permanently fall out. 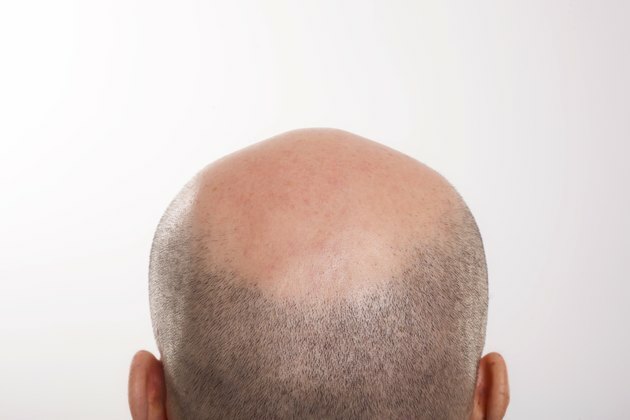 This causes small bald patches to form on the scalp. Tinea capitis, a fungal infection, is also called ringworm of the scalp. This condition is caused by dermatophytes, which are mold-like fungi. Ringworm of the scalp causes pus-filled sores, small black dots or round lesions to form on the scalp. The lesions may be inflamed or red and cause itching and swelling. In severe cases of tinea capitis, the hair breaks off, leaving bald patches of skin on the scalp. Lichen planus is an inflammatory condition that can affect the mouth, skin or both. Although there is no known cause for this disease, the American Academy of Dermatology states many dermatologists think it is an autoimmune disease that causes white blood cells to attack healthy skin and mucous membranes. Lichen planus causes reddish-purple bumps that are flat and may be extremely itchy. In rare cases, these bumps grow on the scalp, which is a specific type of lichen planus known as lichen planopilaris. This condition can cause irritation of the scalp and may also lead to permanent hair loss. Psoriasis is a skin condition that causes scaling of the skin to occur. This can be seen as slight scaling or thick, crusted plaques that cover the scalp. The scaling has a powdery appearance and a silvery sheen that distinguishes it from seborrheic dermatitis and other skin conditions. Severe cases of psoriasis may cause temporary hair loss, but the hair grows back once the condition has been treated and is under control. Lichen simplex chronicus is a skin condition that causes chronic itching. It begins with something that irritates the skin and causes the person to scratch or rub the itchy area. Repeated scratching causes the skin to become thicker, which can also lead to itching. With continued scratching, the skin becomes thicker still. The cycle continues and may result in the skin taking on a leathery appearance. Lichen simplex can be seen as skin lesions or plaques that have distinct borders. These lesions cause itching and scaling and may cause the skin of the affected area to become darker. If the hair follicles on the scalp become irritated from the itching and raw areas associated with lichen simplex, hair loss may occur.